The secret to layered lighting in bathroom lighting is to use multiple lighting sources. Kitchen and bathroom lighting share a lot in common. Each square foot of the bathroom should have not less than 2 Watts of light. 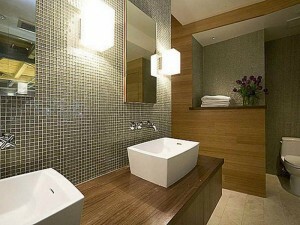 The categories of bathroom lighting includ e ambient lighting, task lighting, and decorative lighting. A bathroom cannot be well-lit using one source of light. For ambient lighting, a center ceiling light will work perfectly however you cannot depend on it for your task lighting needs. This is because it will cast shadows on your face. Due to that, the ambient light should have a dedicated switch along with a dimmer. To enhance the attractiveness of the bathroom consider installing decorative light fixtures especially if you have space. 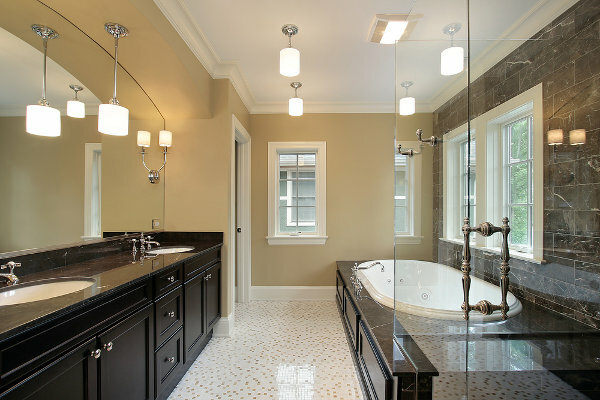 Large bathrooms need decorative lighting to eliminate the emptiness and create a warm feeling. Examples of decorative lighting fixtures include recessed lights, vanity lights, wall and ceiling fixtures, sconce lighting, bath light bar etc. Lighting up the task areas in the bathroom such as the mirror where you apply makeup and do your personal grooming requires lighting that has the color temperature of daylight. Take full advantage of the natural light from the sun as much as possible. Fluorescents and LEDs are not the best options for task light unless they have a high color rendering index. Besides daylight halogen lamps or incandescent bulbs are the closest to natural daylight. 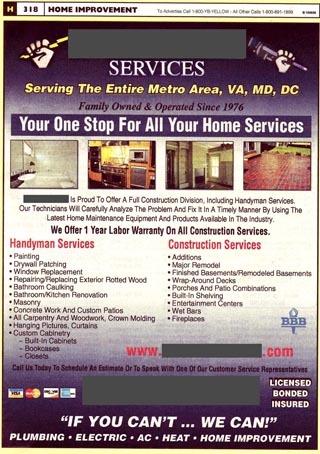 Rather than installing the standard vanity light i.e. the strip light replace them or use them together with wall sconces which is much more effective.To find out more about task lighting options click here. Designing a good bathroom lighting will determine the overall bathroom experience especially if you looking for some luxury and style. Discuss the elements of bathroom lighting with a professional electrician to select the best options and for the electrical plans. Adhere to the regulations for electrical installations for safety reasons since water and electricity can be a dangerous combination. Do not undertake any electrical work unless you are a qualified professional.